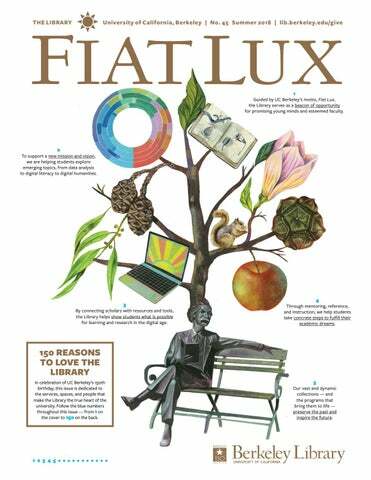 Guided by UC Berkeley’s motto, Fiat Lux, the Library serves as a beacon of opportunity for promising young minds and esteemed faculty. To support a new mission and vision, we are helping students explore emerging topics, from data analysis to digital literacy to digital humanities. By connecting scholars with resources and tools, the Library helps show students what is possible for learning and research in the digital age. Through mentoring, reference, and instruction, we help students take concrete steps to fulfill their academic dreams. 150 REASONS TO LOVE THE LIBRARY In celebration of UC Berkeley’s 150th birthday, this issue is dedicated to the services, spaces, and people that make the Library the true heart of the university. Follow the blue numbers throughout this issue — from 1 on the cover to 150 on the back. Our vast and dynamic collections — and the programs that bring them to life — preserve the past and inspire the future. Jeffrey MacKie-Mason University Librarian My last checkout? Libraries of the Future by J.C.R. Licklider. 6 Published in 1965, it presents a vision for the role of technology in libraries that is still relevant today. We dug up this slice of history from the University Archives 16 — an image made on Charter Day in 1920, with Doe Library in the background — and held it up at the same place on this year’s Charter Day, 98 years later. Although the campus — and the fashions (hello, top hats!) — have changed, the Library’s importance as a hub of knowledge remains the same. BEYOND THE BOOKS: WE ARE HERE FOR YOU With rare job opportunities and uniquely calm corners, the Library helps students navigate college and beyond There’s more than one side to every story. And at The Bancroft Library’s Oral History Center, there are thousands. This fall, the OHC will publish videos and audio from more than 250 interviews on Rosie the Riveter and the World War II home front. 17 Under the hood of the colossal project — as with all of the OHC’s undertakings — are undergraduate students who are taught not just how to stitch together an interview 18, but to build a story. 19 “What I’ve taken away is an appreciation for different voices,” 20 says Maggie Deng ’19, who started working at the OHC as a freshman. “In history classes I’d always ask, ‘OK, this happened, but what did people at that time think?’ That’s what makes oral histories special; you’re getting that first-person, real — biased or not — perspective of people who lived through those events.” 21 The OHC employs about a dozen of the nearly 600 students who work for the Library. 22 And Berkeley’s more than 40,000 undergraduate and graduate students depend on the Library’s services, spaces, and scholarly resources. Passion for the past, skills for the future As the Oral History Center revamps its online presence, students have been at the heart of the process. They help produce a podcast 23, craft the center’s social media presence, and digitize audio trapped in cassettes. 24 Essentially, it’s students who help make the center’s work accessible. “The heart of what we do and are funded to do is to create the interviews, and leave them for the world to have,” says David Dunham, technology lead for the OHC. “A number of years ago, we got all the transcripts online, and that’s great — they’re there. But how do people find them?” Students are also trained in the editorial side of production. 25 They review transcripts, draft section summaries, and research topics for interviewers. For Dunham, the goal is to leave students with a passion for oral histories and skills they can take with them wherever they go. 26 “We learn from them, and they learn from us,” he says. Familiar space provides peace of mind The air vent in a classroom in Mulford Hall is growling. The books lining a Doe Library reading room whisper a thousand secrets. When Hari Srinivasan steps into a new environment, he’s often bombarded by sensations such as these. Srinivasan has nonverbal autism accompanied with sensory dysregulation. Foreign spaces can send his brain into a kaleidoscopic frenzy. With UC Berkeley’s Disabled Students’ Program, the Library works to support students with disabilities, such as Srinivasan. This past semester, they helped ensure he could take all of his exams in Moffitt Library, a familiar, comfortable place. 29 “When you are in a new environment, you are spending a lot of mental energy trying to process it,” Srinivasan says via text-to-speech software. “During an exam, I want to be able to focus.” Srinivasan is a research assistant for Stephen Hinshaw, a campus psychology professor who studies the stigma surrounding mental illness. For his work, Srinivasan uses Library resources to pore over countless academic articles. 30 After graduating, he plans to pursue a Ph.D. “I really want to use what I learn here at Cal towards research and advocacy such that it will improve the quality of life for individuals like me,” Srinivasan says. “I don’t have so much favorite items as I do favorite happenings,” says Bob Hirst, general editor of the Mark Twain Project. Thirty-five years ago, Hirst was flipping through the Clemens family Bible 31, which Twain’s mother had used as a kind of filing cabinet. In it, Hirst stumbled upon a scrap of paper that he believes Twain printed as a young typing apprentice. “If that’s correct (and I believe it is) it became the oldest piece of paper we knew he had actually ‘written’ anything on,” 32 Hirst says. The Mark Twain Project. Folder MT01730, filed in the Writings Drawers, 1847-1853. THE FEATHERS IN OUR CAPS Librarians discuss some of their favorite items in the collections — and why they’re so special In the late 19th century, archaeologists, with funding from Phoebe Hearst, discovered a trove of manuscripts from the Ptolemaic period in Tebtunis, Egypt. Today, The Bancroft Library’s Tebtunis papyri collection is one of the largest such collections in the world 33, according to Peter Hanff, Bancroft’s deputy director. This manuscript 34 , from around A.D. 200, was worn as an amulet protecting against fever, and addresses a deity called Kok Kouk Koul with a pattern of “magic” words. Oracle bone fragments, dating back as far as 1400 B.C., bear the oldest written scripts in Chinese 35, says Peter Zhou, director of the East Asian Library. During the Shang Dynasty, diviners would carve questions into turtle shells and ox shoulder blades and heat them. The resulting cracks were interpreted as answers from gods. C. V. Starr East Asian Library, Fong Yun Wah Rare Book Room. To learn more about how to support the Library’s collections, contact the Library Development Office at 510-642-9377 or give@library.berkeley.edu. A LIBRARY FOR UNDERGRADUATES, BY UNDERGRADUATES New fellowship program tackles barriers to research and learning Story by Virgie Hoban. Read more online at ucberk.li/fellows. he graffitilike carvings covering Huaca de la Luna, an ancient site outside Trujillo, Peru. For her senior ded 88 unique incisions at the site, the first such study of the art. > Caitlin Cozine ’20 was a library research fellow. This past semester, Cozine spent weeks undercover at various reference desks, observing the barriers students faced, and brainstorming how to make Library spaces more welcoming. > Alicia Auduong ’19 was a Makerspace fellow. Auduong is the president of the student club b.Makerspace and is helping librarians redesign and reimagine the Makerspace as a collaborative hub. > Gabriella Wellons ’18 was a digital humanities fellow. For the fellowship, Wellons created data visualizations using coordinates and images of engravings 63 she had discovered at an ancient site last year. To find out how to help the Library support the university’s undergraduate initiative, contact the Library Development Office at 510-642-9377 or give@library.berkeley.edu. Catalogers provide, organize, and uncover information about The Bancroft Library’s materials, from rare books to manuscripts to photographs. As manuscripts cataloger at The Bancroft Library, Kenna Fisher often investigates rare items 71, uncovering the secrets they hold. A magnifying glass 72 lets her take a closer look at the materials she encounters: “I’ve used it to try and discern handwriting, dates, or individual letters or initials,” she says. Embedded in the handle of the magnifying glass is a high-powered lens, which she once used to make out the words on a small metal seal from a government entity in Italy. The mini-spatula 73 is used to remove staples without causing damage, or to carefully separate pages that are stuck together, and book snakes 74 safely hold open books. A book knife, or paper knife 75, is used (only with permission of the curator of rare books) to “open” — or cut the edges of — the untrimmed and still-connected pages of a book. Conservation Treatment Division, Preservation Department In the basement of Doe Library, the Preservation Department’s Conservation Treatment Division works busily and carefully to maintain the Library’s expansive collections. The OptiVISOR 76 is a magnifier worn around the head, keeping conservators’ hands free during precision work. Bone folders 77 are used in many ways, including to fold or score paper, and rub down and smooth out material that has been pasted. The water brush 78 is a tool that separates strips of lightweight handmade Japanese paper used to mend tears, giving them feathered edges. Conservators here gently tamp down materials — such as paper that has been affixed to an irregular book surface — with a Japanese stencil brush 79, made of deer hair. The team uses a modified spokeshave 80 to pare down leather for repairing book bindings. Fine pointed brushes 81 are used to apply the tiniest amount of paste — or to paste onto a small area. Library Design Office The process of keeping our spaces engaging and useful 82 depends on the work of the Library Design Office, which supplies the planning, vision, and coordination to transform a project from an idea to a reality. Tracing paper 83 is used early in the design process, to test ideas when more than one solution arises for the same problem. Instead of using pencils, Sukhjit Johal, who is in charge of capital projects at the Library, prefers the permanence of pens. 84 An architect’s scale 85 helps ensure elements in a drawing are in the same proportion, and architectural plans 86 are used to communicate ideas to a client. As for the doorknob? 87 Johal likes to salvage items that are original to Doe Library, which was completed in 1911. “Who knows when they can come in handy in future renovations?” he says. 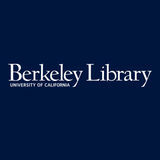 Interlibrary Services ships and receives materials every day, opening the UC Berkeley Library’s wealth of resources to institutions across the world, and connecting the Library’s users with materials from beyond its own collections — including physical items and digital scans. Rubber bands 88 are used to secure items together before shipping them to institutions around the globe, and packing tape 89 is used to seal boxes for daily UPS pickups or FedEx drop-offs. Plastic wrap 90 helps contain the books that come and go through the Library’s doors on carts and book trucks. Sometimes, when an older item is paged and retrieved from Main Stacks, it doesn’t have a barcode attached or a record in the Library’s system. The team uses these sheets 91 to add a barcode, allowing the item to be properly checked in and out and tracked. Take our quiz: Home to 25 libraries, the UC Berkeley campus has an array of amazing spaces, whether you want to study, explore, collaborate, get research help, immerse yourself in virtual reality — or just about anything else you can think of. So which Library are you? A conversation with Engineering Librarian Lisa Ngo What is your role as an engineering librarian? I purchase materials and inform departments about new collections 92 we have that might be relevant to their teaching and research. I also do outreach to undergraduates 93 and the College of Engineering to promote the space, collections, and services we offer. What are some of the important services the Library offers to the young engineer? For undergrads, we’re an important, inclusive space where everyone’s welcome. 94 There’s a community feel, and that’s really important. We also have the course reserves 95, so they can check out textbooks, and we do laptop checkouts. 96 We’re also a REST Zone, so lots of napping 97 going on, too. For graduate students and researchers, our core services are helping with data management 98 and workshops for their writing. 99 Do you have any favorite items in the Engineering Library’s collection? We’ve got some really cool historical Bay Area stuff. We have original plans for where the Transbay Tube was going to go for BART. 100 We also have a big government documents collection 101, too — a lot of really old and cool technical reports from the Department of Energy and Department of Defense. What’s one cool project that you’ve helped out with? When the World Trade Center was hit, one of our civil engineering faculty members was called on the scene to study the steel structures and what actually happened there. He had this cool collection of pictures and documents and reports, and a member of the public made a (Freedom of Information Act) request for public access to those things. We helped make a public website where he could put up all of his documents. 102 How has the space changed over the years? We were renovated in 2011. The stacks used to be downstairs and upstairs — it was just shelves and books. The No. 1 thing students had asked for was more study space. So we reduced our physical collection by 40 percent by storing most of it at NRLF (an off-site storage facility), tore out the shelves, and put in the study rooms. 103 (The next year), our gate count went up by more than 100,000 students. They loved it. Finally, as a librarian, have you ever had to tell someone to be quiet? Yep, all the time: “Keep it down, put away your food, there’s no food allowed.” We’re known as a loud library. On your mark, get set, or go? Northern Regional Library Facility, in Richmond, is a bunker of shared knowledge, bursting with materials from Northern California libraries. 118 It’s also running out of space. The UC Regents recently approved an expansion, which will add the capacity for 3.1 million more print materials 119, providing a cost-effective way to store valuable information into the future. What is the most common question you get about your job? Well, from people outside the Library, it’s, “What is ILL?” (Interlibrary Lending). Another question we get often is, “Can you borrow outside the UCs?” People think we are limited to UCs, and we’re not. We’re nationally and internationally networked. 133 Do you have any memorable stories of connecting someone with an item they requested? We were contacted by the daughter of a person who had been a prisoner of war in World War II in the Philippines. He was an American serviceman, and she knew the date, roughly, that he came back after the war and was trying to get information for her mother — the father had passed away. We were able to find a San Francisco newspaper article from late ’45 or early ’46 that showed the ship on which he was repatriated coming through the Golden Gate. We sent it off to the family, and they were really delighted. It’s always nice when you touch people like that. 134 What’s your favorite library at UC Berkeley? I have to say Morrison Room. It’s like a little oasis in a sea of craziness 135 sometimes. Betty Pacheco ’54, M.A. ’57 started working at a young age. She remembers being about 4 years old, helping dry apricots on the family ranch. “If you don’t want to do this all your life, you have to go to college,” she remembers her mom saying. And that’s just what she did. Pacheco became the first in her family to attend college. At Berkeley, Pacheco worked as a researcher alongside noted physical education expert Franklin Henry. They focused on deep muscle and exercise physiology, and worked with Roger Bannister, the English athlete who cracked the four-minute mile. For much of her research, she notes, she relied upon the Library. 143 “I used the Library a lot, particularly the Doe Library, because it was just a nice, comforting, quiet place where you could access any materials that you really wanted to,” 144 Pacheco says. A few years ago, Pacheco decided to include the Library in her bequest plans and become a member of the Library Legacy Circle 145, a group of donors who have decided to support the Library through planned giving. “I thought that ... might impact lots and lots of students,” she says. to love the Library — you! The Berkeley campus gets only 14 percent of its operating budget from state funds. Your generous gifts allow the University Library to serve the next generation of scholars around the world. Join us as we celebrate 150 years of light — and bring new knowledge to light for many years to come. Fiat Lux!